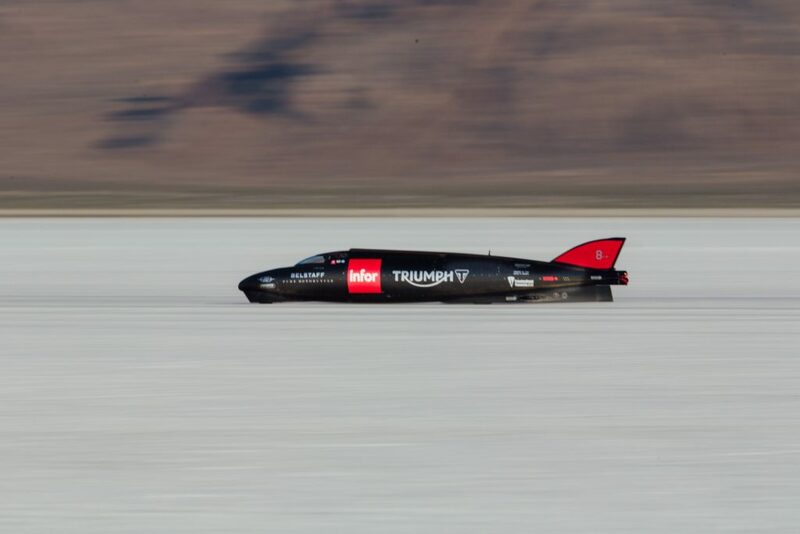 He may still be short of the official streamlined motorcycle land speed record of 376.63mph (606.12km/h), but Guy Martin has become the fastest ever Triumph rider in preparation for an attempt on the world record at the hallowed Bonneville Salt Flats in Utah. The 34-year-old racer and television personality piloted his turbocharged streamliner past the the previous official fastest Triumph speed record of 245.667mph (396.362km/h) as well as breaking the unofficial record of 264mph (424.86km/h). The Triumph Infor Rocket is a carbon Kevlar monocoque construction. It’s more than 7.5 metres in length (7772mm) but only 610mm wide and 900mm high. Its two turbocharged Triumph Rocket III engines run on methanol fuel and produce a combined 745kW (1000hp) at 9000rpm. Martin is expected to challenge for the land speed record in the next few days.